Government Shutdown Leads To A Spike In Canceled Immigration Hearings The backlog of more than 800,000 immigration cases awaiting hearings, which has grown almost 50 percent under the Trump administration, is forecast to grow even larger. 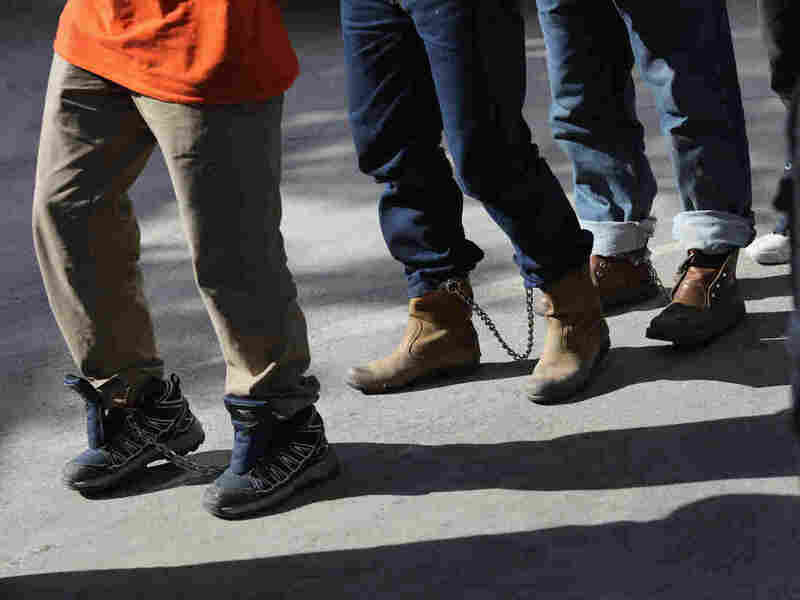 Unauthorized immigrants leave a court in shackles in McAllen, Texas. More than 40,000 immigration court hearings have been canceled since the government shut down. The report by the Transactional Records Access Clearing House at Syracuse University concludes that as many as 100,000 individuals will have had their hearings postponed if the shutdown continues through the end of January. Between Dec. 24 and Jan. 11, 42,726 scheduled cases were not heard. "Individuals impacted by these cancellations may have already being waiting two, three, or even four years for their day in court," the report says. As NPR's John Burnett reports, immigrants who have had their hearings postponed or canceled may have to wait until 2022 for a rescheduled hearing. "The White House has asked Congress to fund 75 new immigration judges to help clear overcrowded dockets that have ballooned in the past five years with more asylum claims," Burnett added. Even if Congress approved the hiring of new judges — and that is a big if, considering the current stalemate over immigration policy — the case backlog is massive. "Since few cases are being resolved during the shutdown, each week the shutdown continues the practical effect is to add thousands of cases back onto the active case backlog which had already topped eight-hundred thousand (809,041) as of the end of last November," the report adds. The case backlog has risen almost 50 percent since President Trump took office. NPR's Laura Benshoff reported earlier this month that the rescheduling of immigration hearings can be devastating for some, or a blessing in disguise for others. "For example, pushing back a hearing could mean an immigrant who qualifies for status now may not in the future if immigration policies are restricted. Or, if an immigrant doesn't have a strong claim for status, a delay means more time in the U.S. and maybe even qualifying for another form of immigration status in the interim." The 10 states experiencing the most immigration hearing cancellations are California, New York, Texas, Florida, New Jersey, Massachusetts, Virginia, Maryland, Illinois and Pennsylvania. The Justice Department office that oversees the immigration courts, the Executive Office for Immigration Review, did not respond to requests for comment. A recorded message said that the press office is closed due to the government shutdown.